Recipe Yield: Total time: 50 minutes, plus resting time | Makes about 32 (2-inch) cookies. Step 1 In the bowl of a food processor, pulse the hazelnuts until they're finely chopped with most pieces the consistency of steel-cut oatmeal and a few slightly larger ones, about 10 one-second pulses. Or chop the hazelnuts by hand. Step 2 In a large bowl, whisk together the flour, cinnamon, baking soda and salt. Add the chopped nuts and whisk well again, then make a well in the center. Step 3In a deep, medium bowl, whisk together the olive oil, honey and zest until the mixture is thoroughly blended and turns opaque, about 1 minute. Pour the oil mixture into the center of the flour mixture. Working from the center, combine the wet and dry ingredients with a dough whisk or a wooden spoon. When much of the flour is incorporated, bring the dough together with a few gentle turns — it should be soft and moist. If it is dry, gently knead in a tablespoon or two of milk. Cover the bowl with a plate and set aside for 25 minutes. Step 4Meanwhile, place one rack in the top third of the oven and one in the bottom third and heat to 325 degrees. Line two large rimless baking sheets with parchment paper. Step 5Once the dough has rested, divide it in half, working with one half per baking sheet and keeping the remaining dough covered. Using about 1 heaped tablespoon at a time, roll the dough into 1 1/2-inch balls. If the dough cracks, gently press and roll until smooth. Place the balls onto the baking sheets, spacing them about 2 inches apart. Using the thick end of a wooden spoon (about 1/2 inch) or your thumb or index finger, gently press each ball down to flatten by about a third — don't worry about some cracking — then fill the indentation with about 1/2 teaspoon jam. If you use hazelnuts, don't make an indentation but press the nut in while gently holding the thumbprint with your other hand. Step 6Bake until the cookies firm up and are deep golden brown all around but still yield slightly when gently pressed with a finger, rotating the sheets once halfway from front to back and top to bottom, 23 to 25 minutes total. Carefully slide the cookies with the parchment paper onto a wire rack to cool completely. They will firm up as they cool. Thumbprints will keep at least 5 days in an airtight container. In Recipes-list.com we have selected the most viewed recipes from category - Desserts . Enjoy the best recipes specially selected for you! 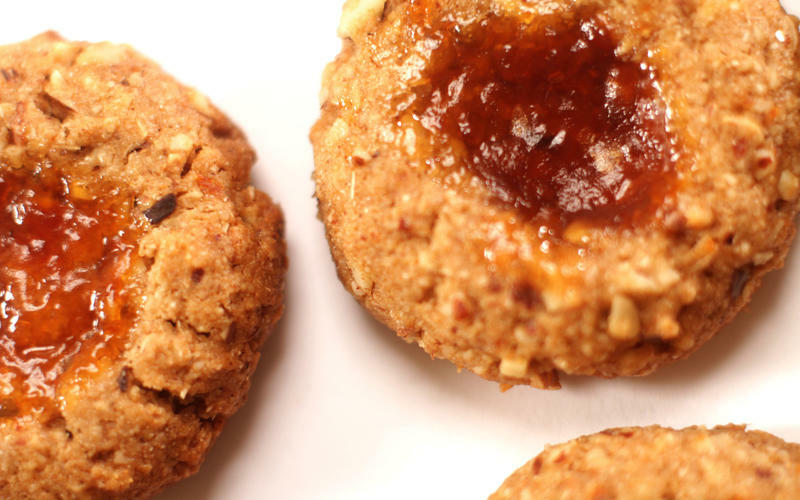 Barley thumbprints with honey and hazelnuts is the right choice that will satisfy all your claims.